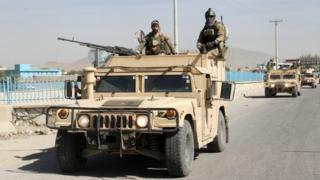 Image caption Afghan government forces have said they now control the city. The Afghan Taliban say that they have withdrawn from the strategic city of Kunduz after having "achieved their objectives". The Taliban overran the city last month and controlled it for three days, before being pushed out of key areas. The offensive was the first time the Taliban had taken a city since being ousted from power in 2001. Also on Tuesday, a rocket allegedly launched by the Taliban killed two people in southern Ghazni province. The Taliban captured Kunduz on 28 September in an offensive that took Afghan government forces by surprise. But after several days, Afghan officials said they had retaken control of key areas of the city with the aid of air strikes by US forces. On 3 October a US airstrike on a Medecins Sans Frontieres (MSF) hospital in the city killed at least 22 staff and patients. Fighting in Kunduz has largely been confined to the outskirts of the city in recent days. Taliban spokesman Zabihullah Mujahid said the Taliban were able to free hundreds of fighters from Kunduz prison and were able to capture various types of military equipment. He said the Taliban had withdrawn in order to protect civilians from air raids. Meanwhile, clashes were reported in the province of Ghazni on Tuesday. A rocket allegedly launched by the Taliban landed in Ghazni city, killing two people. The deputy governor of the province has told the BBC that the highway leading to the southern province of Kandahar was now closed and that Afghan forces were pushing the insurgents back. There are reports of residents fleeing the area to neighbouring cities, with some making as far as the capital Kabul.